Can a fat person eat honey? Can diabetics eat honey? Isn’t the glycemic index too high? Honey is sweet. Really sweet. Even sweeter than sugar. So how come there are people saying that they eat honey even if they have Type 2 Diabetes? All doctors say we should not consume sweet food if we have this condition, and of course, if we are overweight. Yet, clinical studies and practice say it’s good. The mystery lies in the type of the sugar. There are good sugar, bad sugar, and even toxic sugar. To understand this we will begin from the beginning. Food contains carbohydrates. There are all sorts of diets, with carbs, without carbs… Some people use something that works, others use something else and they work too. And some other people cannot find anything to work at all. Perhaps they miss the holistic approach and forget that food is not the only important thing in someone’s life. But that’s another story, in a different post. What’s all the fuss with carbohydrates? Scientists say: food contains carbohydrates. They can be simple or complex. The simple ones contain one or a few sugars, and the complex ones contain many many sugars. In order to digest and assimilate them, our body breaks all of them into simple sugars. After we eat, our digestive system breaks down the carbohydrates, meaning that it turns them into simple sugars, (monosaccharide) so they can be absorbed into the bloodstream. The speed of them entering the blood, leads to a term called glycemic index (GI). When we eat food that contains lots of simple carbs, they don’t need to be digested anymore and enter the blood immediately. We say they have a high GI. When our digestive system takes more time to digest them and the sugars enter the blood slower, we say these are carbs with slow GI. Very simplistically speaking, when we eat our pancreas releases a hormone called insulin, which turns the sugars into energy and fat. If we eat large quantities of food with fast GI, the pancreas has too much sugar to turn into energy, so it makes some storage and for this it turns the sugars into fat. When we eat food with slow GI, our body transforms the carbs in time, more in energy and less in fats. So, what is the food with fast carbs, that spikes glucose and insulin production? Many carbohydrates present in processed foods and drinks that we consume have a high GI. Even more, they leave our body hungry sooner than natural foods would, thus forcing us to eat more frequently. On the other hand, natural carbohydrates found in fruits and vegetables, legumes, whole grains, etc. tend to enter the bloodstream more slowly. The scale of GI rates from Low GI (< 55), Medium GI (56-69) and High GI (70>). The Internet is full of lists with food’s GI. What is honey’s glycemic index? A total sugars amount of 79.7 g per 100 g honey. But, fructose has a GI of 19, while sucrose (which is in a small quantity in honey) has a GI of 68, and glucose has a GI of 100 (the reference point). As fructose is the main sugar in honeys, we can say that honeys with a high level of fructose (as this depends on the specific flower the honey is made of) have a lower GI. Examples of high-fructose honey: acacia, tupelo, chestnut, thyme, calluna. In Australia, the researchers made a study measuring GI and also glycemic load (GL).This is a term that takes into consideration the quantity of ingested food. It is calculated as the GI multiplied with the carbohydrate content in a certain portion, divided by 100. Values lower than 10 are low, 10 to 20 are intermediate and above 20 are considered high. 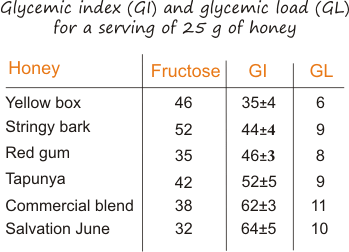 As it can be seen from the table here, most of honeys have a low glycemic index, and some are intermediate. What does diabetes mean? Can diabetics eat honey? If blood glucose levels are rising too rapidly and too often the cells can eventually become faulty and not respond properly to insulin’s “absorb blood energy and store” instruction; over time they require a higher level of insulin to react → we call this INSULIN RESISTANCE. Insulin resistance leads to hypertension (high blood pressure), high blood fat levels (triglycerides), low levels of good cholesterol (HDL), weight gain and other diseases. All these illnesses, together with insulin resistance, is called METABOLIC SYNDROME. An ABSOLUTE LACK OF INSULIN leads to TYPE 1 DIABETES, which requires insulin shots. This type of diabetes is not dependent of insulin and is a metabolic disorder that is characterized by hyperglycemia (high blood sugar) in the context of INSULIN RESISTANCE and relative lack of insulin.The classic symptoms are excess thirst, frequent urination, and constant hunger. Type 2 diabetes represent about 90% of cases of diabetes. Obesity is thought to be the primary cause of type 2 diabetes in people who are genetically predisposed to the disease. In the studies made, honey was well tolerated by type 2 diabetes and of unspecified type. High-fructose honeys and thus with a low GI, administrated in relatively high amounts: 70-90 g per day (3 -5 tablespoons) DID NOT create any problems to type 2 diabetics, and even had favorable effects on them. This type of diabetes depends on insulin and is an autoimmune disease. The classical symptoms of type 1 diabetes include: frequent urination, increased thirst, dry mouth, increased hunger, fatigue, and weight loss. Honey seamed to be well tolerated by type 1 diabetics. In some studies, scientists noticed that it caused a higher c-peptide increase than with comparable amounts of sucrose or glucose. C-Peptide represent the mass of insulin increase in blood. A tablespoon of honey consists of nearly the same carbohydrate (glucose – fructose) content as a medium-sized apple. The diabetic patient can be assured that consuming honey will produce a significantly lower blood sugar response than an equivalent amount of sugar or glucose rich starches. Because after ingestion, honey is rapidly absorbed and converted into glycogen in the liver, thus removing glucose from the circulation and lowering blood sugar levels. (Liver converts fructose and glucose in a 1:1 ratio, into glycogen. Honey has exactly this ratio and this makes it perfect for immediate glycogen release. There is nothing left to raise the blood sugar.) Lowered blood sugar levels mean a lessened demand and release of insulin, thus accounting for a stabilization of blood sugar within the circulation. The reason that honey consumption results in less insulin being produced and released from the pancreas may be related to compounds contained in honey that regulate the production of hepatic insulin sensitizing substance in the liver. Though this hypothesis remains to be confirmed in research, it is known by practice, that eating honey results in a lesser insulin release than what occurs following ingestion of sucrose or high fructose corn syrup. • On 18th November 2015 a study has been published by The Iranian Journal of Basic Medical Science. The study was conducted by Saiedeh Arabmoazzen et al., from the University of Medical Sciences, Ahvaz, Iran, and can be read on ResearchGate.net. The article is named: Antidiabetic effect of honey feeding in noise induced hyperglycemic rat: Involvement of oxidative stress, and it proves the good effects honey has on hyperglicemia. It was done on male Wistar rats, which were devided into 4 gropus: control, hyperglycemic, honey treated control, and honey treated hyperglycemic groups. For induction of hyperglycemia, noise stress was used (a serum glucose level higher than 250 mg/dl.). They scientists measured serum glucose, triglyceride (TG), total cholesterol, low density lipoprotein (LDL), and high density lipoprotein (HDL)‐cholesterol levels. They also measured markers of oxidative stress in brain. The morphology of langerhans islets were evaluated using Gomori staining method. The measurements were done at 4 and 8 weeks after the study. “The results of the present study demonstrate that chronic noise stress increases fasting plasma glucose, lipid profile, and MDA levels and decreases SOD and body weight levels, and degenerates pancreas tissue; honey feeding ameliorates these parameters over 60 days. • Another study, Comparison of antioxidant effects of honey, glibenclamide, metformin, and their combinations in the kidneys of streptozotocin-induced diabetic rats, by Omotayo Owomofoyon Erejuwa et al, published on International Jourmal of Molecular Sciences, investigated the effect of consuming honey with one of two common diabetes drugs – metformin or glibenclamide. Diabetic rats (what would we, humans, do without them??) were randomized into six groups and administered distilled water, honey, glibenclamide, glibenclamide and honey, metformin or metformin and honey for four weeks. Honey significantly increased insulin, decreased hyperglycemia and fructosamine. Alone, the two drugs significantly reduced hyperglycemia, but combined with honey they produced significantly much lower blood glucose. They also reduced the elevated levels of creatinine, bilirubin, triglycerides, and VLDL cholesterol. The number of studies are way too many to be listed here. A google search will reveal lots of them. However, they all say the same thing: honey is beneficial to diabetics. How much honey should a diabetic eat? – in the morning: 1 tablespoon of honey with fruit or yogurt. This will immediately begin to stock the liver glycogen reserve that has been depleted throughout the night. – at bedtime: 1 or 2 tablespoons This will help to “top off” the tank that fuels the brain during the night and prevent the release of cortisol and adrenalin from the adrenal glands. – if you are an active person, take another 1 or 2 tablespoons with fruit snacks, in baked goods, or as used in cooking. – if you are sedentary, you don’t need more honey. If you calculate your calories intake, you should know that honey contains about 60 calories per tablespoon. The percentage of your total caloric requirements provided from simple sugars should not exceed 10%. Thus, the 180 to 300 calories a day provided from honey is sufficient. The dosage depends on child’s weight and activity level. – for 33 pounds (15 kg) a child should take 1 tablespoon per day, divided in 1 teaspoon in the morning and 1 teaspoon at bedtime. – for 66 pounds (30 kg) a child should have 2 tablespoons per day (1 in the morning, 1 at bedtime). 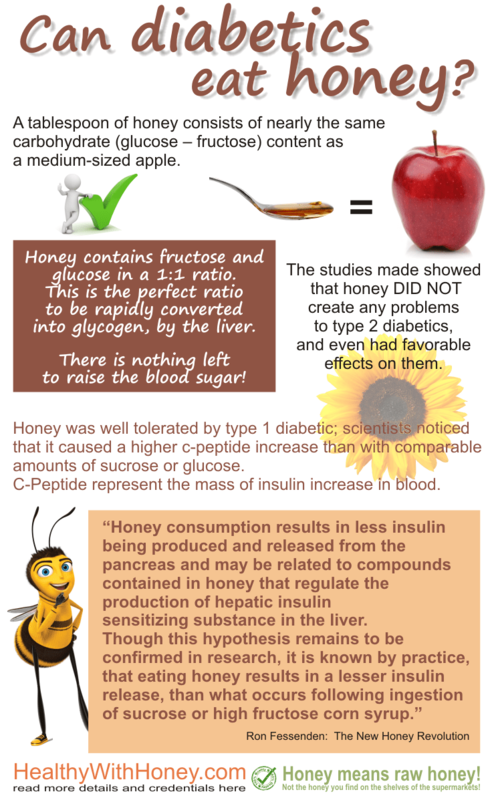 Not all honeys are good for diabetics! 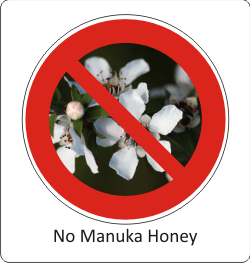 Don’t eat Manuka honey! Or its cousin Berringa honey! There are some honeys which contain excessively high levels of a compound called methylglyoxal (MGO), such as Manuka honey. Read more about its toxicity here: Is manuka honey safe to eat? 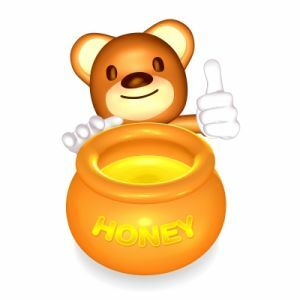 While this honey is incredible good as it has a non-peroxide antibiotic activity due to this MGO, we should not forget that MGO is highly toxic to the cells within the human body. Thus rapid detoxification is necessary and the process of detoxification results in a significant negative side effect. There are researches findings published in 2006 indicating that MGO is also associated with the early phases of insulin resistance. Even short exposures to MGO can lead to an inhibition of insulin-induced signaling. Many other honey varieties may contain some MGO, especially honeys that have been heated. Among high-fructose honeys, with low GI: acacia, tupelo, chestnut, thyme, calluna. See here a more detailed list. And if you are still not convinced about the efficiency of honey in diabetes, you can combine it with real cinnamon, as it is known to control glucose levels in blood. Also please remember that on this site, when we speak about health benefits of honey on our body, we refer only to raw organic honey! It’s not only about diet! There are four equally important things in our lives that together make our life-style. We are all these together. – Arabmoazzen S, Sarkaki A, Saki Gh, Mirshekar MA. Antidiabetic effect of honey feeding in noise induced hyperglycemic rat: involvement of oxidative stress. Iran J Basic Med Sci 2015; 18:745‐751. Can bee pollen boost the sport performance? Can honey help you lose weight? The truth, please! Thank you for all the help here. I am thinking to order Manuka Health ( Fresh NZ Royal Jelly in MGO 400+ Manuka Honey) for its amazing benefits overall in general and for cardiovascular and vitality benefits. This is for my dad as he is a heart patient but doing okay completely. Just wanted to give him something as a nutrient to aid with his general well being. I want to know If it’s safe to ingest 1 teaspoon of this honey mixed in your tea everyday as a nutrient source? I want to try royal jelly and Manuka Honey combined. They also have same thing in 100+Mgo but from what I gather antibacterial properties start around umf 10+ so mgo 400 translates to 12umf or 10umf approx. Please help me in this regard so I can make a wise decision. Thank you! Also he is diabetic and a heart patient. I gather royal jelly helps with it. But at the same time you have said to avoid manuka. What should I go for? I’m a patient of diabetes type 2. Did I can get away from this disease permanently? Medical science get any approach against this disease? If yes than info me where I can go for this? If not than it’s a big failure of medical sciences. Diabetes is a complex disease and there are indeed natural ways to keep it under control. On this site you can find some clues on how to approach it. You can find them here. Is Sidr honey good for type 2 diabetics? As good as Tupelo honey? Is it a high fructose honey? I can’t find on line the glycemic load and glycemic index for Yemen sidr honey, do you have that information? Paul SCHWEITZER, director of Laboratory of CETAM, France, offered the “Analyzes Results of Yemeni Sidr Honey Royal Quality” and thus put some light on the composition of sidr honey (aka jujube honey). He says that there is 25% glucose and 46% fructose in there. And that, yes, it may be suitable for people with diabetes. Happy new year and all the best to you and your dear ones! I am in Saudi Arabia. I just had some sidr honey (best grade). I had 2 teaspoons.my initial blood sugar was 120.About 80 minutes later my blood sugar was 80mg/dl. The price is about $90USD per kilo. So if you had great quality honey it actually lowers blood sigar. This is such a great article!! Thanks alot!! I am going to suggest this to my mom!! I take honey regularly but was a little worried suggesting it to my mom, as she has diabetic!! may Allah bless you always!! Great article and very informative. As raw Greek thyme honey producers, we know the healing properties and the advantages of raw honey on diabetic patients. We produce and sell our honey since 1957 and we have a lot of diabetic patients buying our honey without problems. Some of them have seen important improvement to their problem too. For you interest we want you to know that generally honey never expires. Is one of the foods without expiration date. Raw honey naturally crystallize and you can bring it to the previous fluid condition, with just putting the jar in a hot water tube. Never microwave the raw honey and never over heated. More info about thyme honey you can find in our website http://www.bgreekhoney.com. Great article, Laura. I’ve always thought Manuka honey is better than the average honey. I have a bottle of honey sitting in my kitchen for months now which I have not opened yet but there is no expiry date on it. Will honey go bad? Is it still safe to consume it? It is safe, don’t worry about this. It’s true, honey crystallizes, but this is a natural process, it never gets bad. Honey was found in Egyptian tombs and it was still edible. On regular jars, at least in some countries, the law forces producers to put an expiry date, usually of 2 years. But what it is also very true, is that honey loses its quality, especially its enzymes, which make it so special. In the first 3 months, honey even has probiotics! As for manuka, this is a different story. The distinct factor of it is given by the higher content of MGO (compared to regular honey). It was discovered that manuka honey, increases its quantity of MGO in time. So, if on your jar it is written MGO 5+, in time you may actually have a 7+, or 10+. It needs to be taken to a lab, for more exact figures. And as long as they are under 20+, you can safely eat it. Don’t let it waste, please! Well I am pleasantly surprised! 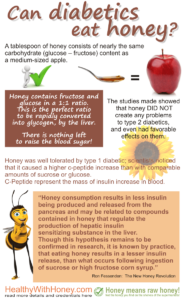 Never knew that honey can be good for diabetic patients as well! Thank you so much for posting such great information! Honey contains fructose and glucose in an equal ratio. This ratio is exactly what our liver wants to make glycogen. Thus the blood sugar is not raised, because the liver took it from the beginning. Great article as usual! I definitely have to show this to my diabetic friend who may not know about this and maybe help him with his diet too. You really break down the science and explaining how everything works, good job with that! Thank you Terence. This was exactly my target. To break down the science. Thanks for information, never suspected that people with Diabetes can eat honey. Was surprised about Manuka honey as first time personally came across negative effects of it. Have to reconsider buying it again. Manuka has become the star of all honeys, but just like all of them, is still a mystery for our scientists. Still researching and studying it. But remains the queen when it comes to skin infections and burns. The best medicine ever. I will definitely have to recommend this to my mom as she struggles with her diabetes as she craves that sweet stuff. Maybe this will help her with her diet! Oh, please tell her about honey. Eating honey covers the necessary craving for sweet. It’s very true. I am type 1 and I know that honey in the right form can be a CURE even. However processed honeys have that bad sugar in. You usually see a clump or accumulation of crusty sugar at the top. If you see that it’s not the good stuff. I buy PURE sidr honey from yemen. It’s £20 for 1kg but absolutely gorgeous. You know it’s good when you pick it up with a spoon and it trickles forever. There are difficult times now and it’s difficult to find honey from Yemen anymore. Anyway, the big sellers can! Amazon may still have. Anyway, here is more on Sidr honey and about its benefits for our health. I hope you find a good source of it. Yes, Sidr honey is different. It has only 11% water and a really small amount of glucose, like 5%. Compared to an average of 30 in the other honeys! Thank you for sharing your experience with honey.